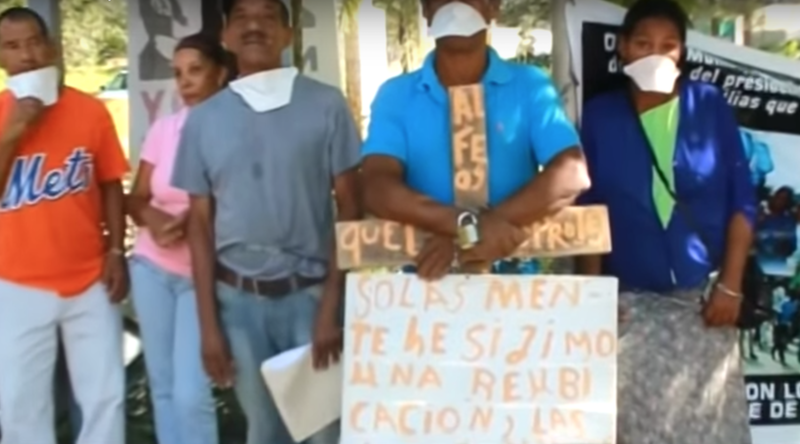 Residents from La Piñita, La Cerca, El Naranjo, and Las Lagunas town of the municipality of Cotuí, located in the central province of Sánchez Ramírez in the Dominican Republic, are rallying against EnviroGold (Las Lagunas). They say the miner’s activities are polluting several water sources in the area and they demand to be relocated. Talking to a local TV station, the protesters showed how the running water that they receive from local rivers has been declared unfit for human consumption given its green-like colour and its fetid smell. They say the company has been forced to provide them with bottled water. One of the residents also showed pipes that, according to him, are releasing toxic water from EnviroGold’s operation to the Maguaca river. He said that once that water goes downstream to the nearby farms, dozens of animals die. Many people, he added, are also suffering from skin problems and other health-related issues. But the company has said that such discharges are legal and authorized by the Ministry of Environment, and that they are done at a slow pace to minimize their impact. EnviroGold (Las Lagunas) is in charge, since 2012, of treating the high-sulfur tailings that were previously deposited in the Las Lagunas Dam by Rosario Dominicana. The protesters say the subsidiary of Australia’s Panterra Gold only cares about extracting gold from the waste and that, currently, it is planning to install a new pipe that will discharge part of the tailings into the river. They say the facility where the tailings are stored is completely full and that once the rainy season starts, there is a risk of collapse.